With only hours left till Nokia's press conference at MWC, we have some fresh details and images of the upcoming announcements. 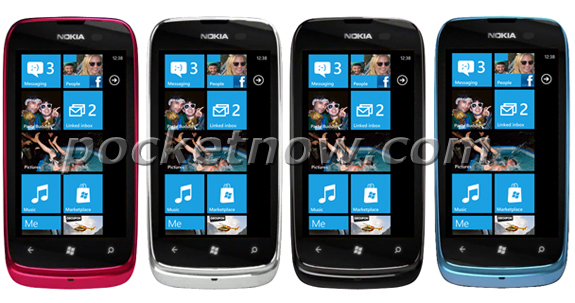 Nokia Lumia 610 pictured below, will be the company's entry level Windows Phone handset. The device is expected to feature a 3.2" screen, 3MP camera, and Windows Phone Tango on board. Given the nature of the new OS, it shouldn't be a surprise if the device comes with 256MB of RAM. The Nokia Lumia 610 will reportedly be priced at €175, when it hits the shelves. India will be one of the first markets to receive the device. Next in line is the global version of the Nokia Lumia 900. The AT&T version caused quite a splash during CES, so there is no surprise here. Also, don't forget the PureView camera phone, whose teaser emerged a few days ago. The device is expected to be the successor of the venerable N8, so the interest towards it is huge. We will be covering the Nokia press conference live (it starts at 7:30AM GMT), so stick around for the full scoop on the company's MWC lineup.